What Can I do With an Online Biology Degree? 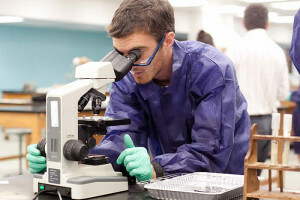 If you love science but aren’t able or willing to attend a traditional college, you’ll be happy to learn that you can get an online biology degree. After graduating from your program of choice, you can choose to start a career in biology, become a teacher or even go on to graduate school to learn more about the subject that you love. Even if you love biology, you could easily end up finding another passion while attending school online. If this is the case, don’t worry too much about wanting a job that isn’t directly related to your degree. Since you’ll have to take general education classes in addition to classes in your major, you’ll also be qualified for a variety of careers that require a liberal arts degree. You don’t need to major in education to become a teacher. In fact, you shouldn’t have any trouble getting a teaching job with an online biology degree as long as you want to teach biology and are willing to take a few classes to become certified. Depending on what other classes you’ve taken, you may be eligible to teach other subjects too. Careers that are more directly related to biology usually pay more, but teachers usually get more vacation time. Depending on your family situation and personal goals, you may decide that one career path is a better fit than the other at a certain point in your life. You should still be qualified for both types of jobs down the road, so don’t feel like your current decision will dictate what you do for the rest of your life – you can always change your mind later. Some people decide to go to school because they have a specific career in mind. Others choose to attend college because they just love learning. If you love learning or want to become a college professor or a researcher in the field of biology, think about going to graduate school. If you earn good grades as an undergraduate and get some research experience from working with professors, you may get the opportunity to go to graduate school without going into debt. Assistantships and fellowships are often offered to bright students in fields relating to science, technology, engineering and math. Doctorate programs are usually more likely to be funded than master’s programs, but both types of degrees can be financed if you’re a good student and look in the right places. Going to college can open up many opportunities. Usually, it doesn’t even matter if you’re a traditional or distance student. If you get an online biology degree, you’ll have many careers to choose from.